I thought for a Saturday posting idea it would be cool to review recipes I've tried from other websites. I lived in the Philippines for 3 years after marrying my wife so I have an appreciation for Philippine cooking. It's not all vintage recipes all the time, I do sometimes cook Filipino recipes to keep her happy and well, I like them too. Now soup in the Philippines is different from soup over here. We've gone happy on cream based soups while in the Philippines the soups are broth based. They can be normal savory soups or they can be sour soups where the broth is given a tangy taste with the addition of tamarind. Traditionally Filipinos will serve this over rice but I just ate mine out of the bowl and it was great. The noodles will absorb the broth overnight so when you reheat it just add some more water. So how does it taste? Excellent! 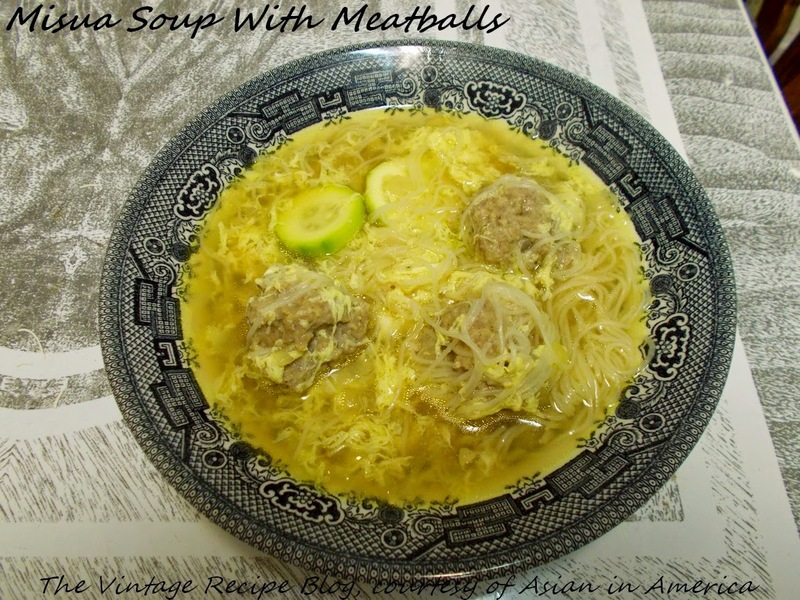 I loved the consistency of the soup where using the rice wash water gives it a silkier feel. The pork meatballs are seasoned just right, but be sure to wet your hands when making them as the raw mixture is quite tacky and will stick to everything. I was actually able to get this soup made quickly after my wife coming home late so it was a winner on the ease of preparation. Best of all I think this is a great crossover recipe that Filipinos love and Americans can enjoy as well. On a final note, for the fish sauce I highly recommend Red Boat brand. It's less salty tasting the Filipino brands like Rufina. I agree with you, it is a big bowl of comfort. Happy Holidays!